Resource provisioning uses a REST POST request sent to the APS controller, which in turn will interact with the application service responsible for the requested resource type. APS implements two different ways of synchronizing the resource provisioning: synchronous and asynchronous. The APS controller explicitly specifies it in the APS-Request-Phase header of a REST request. The APS controller can provision a single resource as explained in the Synchronous Provisioning and Asynchronous Provisioning sections or a bunch of resources as explained in Batch Provisioning. To require a sync provisioning, the APS controller must use the POST request with the APS-Request-Phase:sync header. In the following example, a user requests creation of a VPS. 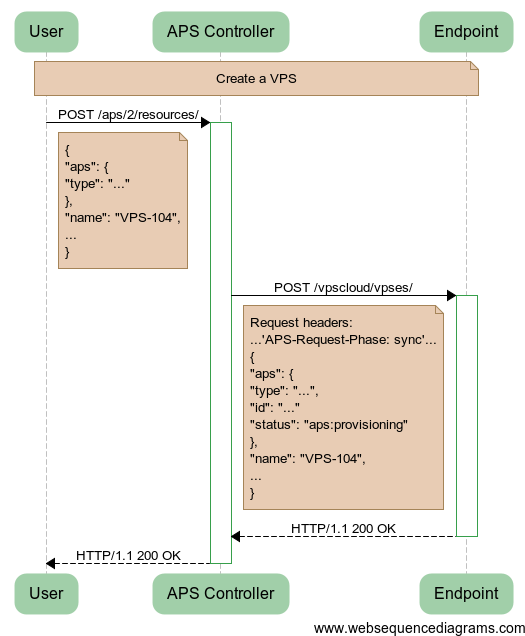 The controller forwards the POST request to the application service endpoint (/vpscloud/vpses/) defined in the APS connector. It also specifies that the request must be processed in the sync mode. The APS application instance (or simply application) must call the provision() method that returns the completion code notifying about success or failure. In the example above, the application notifies the APS controller about successful completion of the operation. The APS controller forwards the return code to the initiator of the operation. The resource status will be aps:ready. Asynchronous provisioning is started the same way as the synchronous operation considered earlier. The application service must decide whether to complete the operation as synchronous or transfer it to asynchronous. The whole transaction actually contains two request phases. The transaction is started with the synchronous phase, as described earlier. The APS controller requires the synchronous provisioning by sending a POST request with the APS-Request-Phase:sync header. Once a sync request is received, the application will call the method for synchronous provisioning. 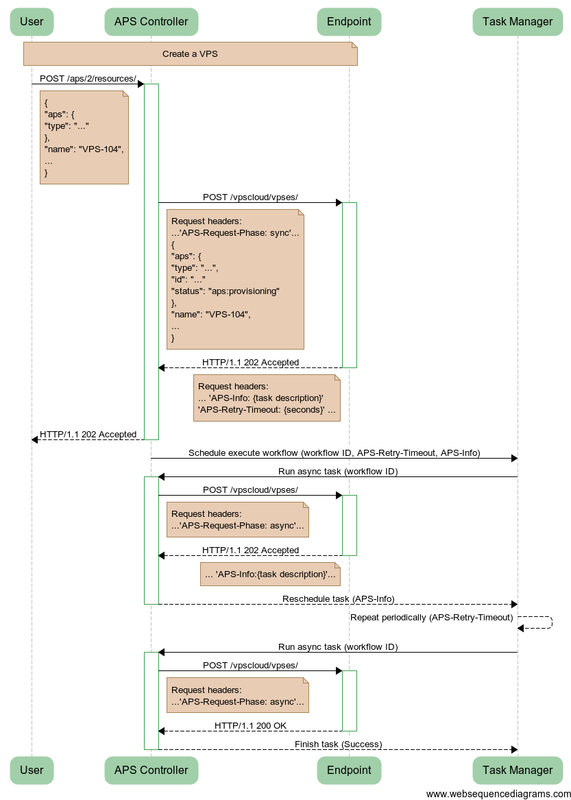 If APS PHP runtime is used, it must be the provision() method. The difference starts here. The method contains a decision code that completes the provisioning either synchronously (as described earlier) or informs the APS controller that the provisioning can be started in the async mode. Here, we will consider the second case, when the application service requires transferring to the asynchronous phase. Therefore, it returns the 202 Accepted code to the APS controller. In the same response packet, it sends two headers that helps the APS controller to arrange the async phase. The APS-Info header contains task description, and the APS-Retry-Timeout header defines the period the controller must use for sending subsequent requests. Once the 202 Accepted code is received, the APS controller completes the synchronous phase by forwarding the response to the initiator of the operation. The resource status will be aps:provisioning. The asynchronous phase is processed as follows. The APS controller calls the task manager of the hosting platform to schedule a workflow and set its timeout equal to APS-Retry-Timeout. In accordance with this workflow, the task manager must wake up the APS controller to initiate the asynchronous request. First time, the task manager will activate the scheduled workflow immediately. The APS controller sends its first async request to the endpoint to confirm its readiness to proceed in the asynchronous mode. This time, inside the endpoint, the method for async provisioning must be called. APS PHP runtime calls the provisionAsync() class method, when a provisioning operation with APS-Request-Phase:async is required. If the endpoint returns the expected 202 Accepted code, the APS controller reschedules the workflow task. Next time, the task manager runs the scheduled task not earlier than the specified APS-Retry-Timeout value. This is repeated until the endpoint returns a code different from 202 Accepted. Once a code different from 202 Accepted is received, the APS controller calls the task manager to finish the scheduled workflow. If the requested resource was created successfully, its status will be aps:ready. The following example illustrates how the APS PHP runtime on the application endpoint helps to develop operations for synchronous and asynchronous provisioning. The sample code defines two operations in the custom vps class. The provision() method is called when the request for the sync provisioning is received. It checks the hardware->VM property to identify the kind of VPS required. If VM is false, a container must be created. Since this does not take long, the synchronous operation is completed successfully. Actually, the provision() function does nothing in this case, and the PHP runtime returns 200 OK to the APS controller. If VM is true, the virtual machine (VM) is required. Since this usually takes long, the method throws the exception that the PHP runtime processes and returns 202 Accepted to the APS controller. In the code here, we simulate 5 retries with 30 sec timeout. When the endpoint receives a request for async provisioning, it calls the provisionAsync() method. If the provisioning is not completed (simulated by a number of retries), the function throws the same exception as the provision() function does. The 202 Accepted code is returned. The state property is an internal resource property managed by the provisioning code as needed. It can be used by the custom UI script to display the VPS state to users. If the provisioning is completed, the function will not throw an exception, and the PHP runtime returns the 200 OK code to the APS controller. "id": "APS ID - optional property"
The POST request addresses the base APS controller endpoint. The body of the request is an array of JSON representation of resources. To link a resource to another resource, the APS ID of the latter resource must be contained explicitly in the JSON representation of the former resource. Once the APS controller receives a request for batch provisioning, it schedules provisioning of each resource in the list one by one. It does not matter if some of the resources are provisioned synchronously and the others are provisioned asynchronously. When provisioning a resource by a request from the APS controller, the application can request the APS controller to provision some resources and link them with the resource being processed. Also, the application may require the APS controller to link existing resources with the resource being processed. Normally, the APS controller rejects such requests until the resource is provisioned and gets the aps:ready status. However, if the application adds the sub-requests to the started transaction, the APS controller overcomes that limitation. If processing of the initial request or a sub-request fails, the APS controller rolls back the whole transaction.